Sanitation, safety, and savings is our motto here at Brill Seat and bringing our customers the latest innovation innovations in automatic toilet seat cover technology. Establishments today who host public restroom facilities are tasked with keeping them sanitary and presentable for the next patrons. We know better than anyone patrons don’t always respect these public spaces, often leaving behind a mess the cleaning personnel has to deal with. Why invest in our automatic toilet seat covers? They’re the ideal, cost effective solution to keep public bathrooms clean without having to worry wasted product or effort on the behalf of your cleaning personnel. Our automated system automatically replaces the toilet seat cover every time a patron is done using the facilities. When the next person arrives, they have a clean surface to use so they don’t have to worry about cross contamination. Our toilet seat cover system is unique in its design and execution, there’s truly nothing else like it on the market. We believe in providing our customers with a cost effective, innovative solution to deal with the issues of maintaining a public restroom. Our automated system uses a sensor to tell when a patron is using the facilities so it knows when to replace the toilet seat cover. Once the patron is done, the system rips off the now used toilet seat and stores it in a plastic role so it can’t be reused. The system then places a new and unused toilet seat cover over the surface so it’s ready for the next patron. 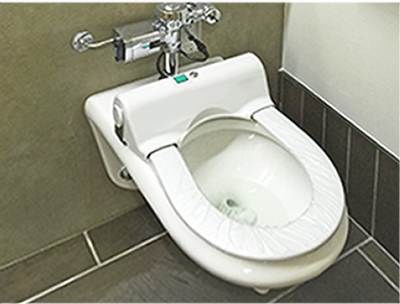 Our automatic toilet seat cover system is ideal for eliminating germs and decreasing the need for maintenance. Cleaning personnel can easily spend an hour or more cleaning up a public restroom taking care of any debris left on the floor. This makes the time they have to clean less efficient and can keep them away from other tasks. Our system is hands free so there’s a less likely chance of patrons dropping a toilet seat cover on the floor. Since the covers are one time use only, they also ensure patrons will have a fresh surface every time they use the facilities. The other advantage our system has is eliminating germs and keeping the bathroom sanitary. One of the concerns of using a public restroom is the risk of cross contamination in such close quarters. The bathroom can be an ideal breeding ground for bacteria since the conditions are often warm and humid. Water splashing up from sinks can end up pooling on the floor which makes for ideal conditions for bacteria to grow. Finding ways to increase sanitation, but not creating extra work for your cleaning personnel provides an innovative solution. Consumers who have tried our toilet seat cover system have come to find they enjoy the savings, sanitation, and safety of using our product. Traditional toilet seat covers have been applied manually which means patrons will be touching the surface of the toilet. This makes traditional toilet seat covers ineffective since patrons will now have any germs or bacteria from the surface on their own hands. 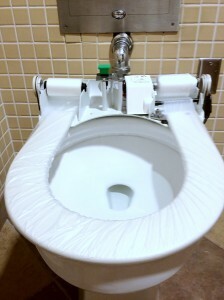 Regular toilet seat covers are often made from poor quality materials and are too fragile for use. They can often tear easily, be blown away, fall to the floor, or even fall into the toilet itself. This wasted product can cost quite a bit in the long run and makes them an ineffective solution to maintaining the sanitation of the public restroom. Consumers who have tried our toilet seat cover system have found it to be an amazing innovation for their company. They’re able to eliminate germs, making cleaning more efficient for their personnel, and best of all enjoy the savings of product that isn’t wasted. Give our system a try and experience the difference for yourself.